Deploy Gmail, Google Docs, Google Calendar and other web apps to your employees. It's all hosted by Google, saving your company the time, money and hassles of managing these IT solutions yourself. We have solutions for small businesses, schools, non-profits, and individuals. Small businesses usually have to pay a premium "Enterprise" level service fees for any type of Business Apps setup. Texas Techies will provide you with a reasonably priced service so that you can enjoy all the great utility applications from Google. Our customers have given us very positive feedback on how our reasonably priced but high quality services have helped them avoid the frustrations that could come from missing one tiny bit of instruction or one silly typo that could ruin the whole setup. Although Google has done a great job documenting how to do the Apps setup by yourself step by step, most of the small business owners have no idea what a CNAME or MX Record means. They just want it all to work. And that is where we come in. 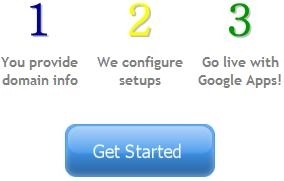 We help you avoid all these mind boggling intrinsic details of setting up Google Apps for your domain. We can get you up and running in no time. No special hardware or software is required, and Google runs the servers so you can focus on your business. Data can remain on Google's infrastructure, rather than on unsecured devices. Get up to 50 times more storage per user than the industry average. Reduce clutter with effective spam filtering and automatic message threading. Find information instantly with Google-powered email search. Access from any computer or mobile device, plus Outlook and Blackberry interoperability. Work together on documents, even in real-time, without the hassle of attachments. Helps you securely share between Windows, Mac and Linux with coworkers and contacts. Quickly build team sites and portals where everyone can contribute and learn. Access your content from any internet-connected computer or mobile device. Essential collaboration apps – Google Docs, Google Video and Google Sites are included. Worker mobility – Access your data from anywhere. Employees can be productive from any computer. Information access control – Each piece of content can be as private or as public as necessary. Enterprise-class service – Google Apps includes a 99.9% uptime SLA. * Phone support is available for critical issues. Protect your company's documents – Administrators have fine-grained controls to manage how broadly employees can share corporate documents. Work together without the hassles of attachments – Coworkers can share the same online copy of each doc, spreadsheet or presentation. All revisions are saved and recoverable. Present and publish through the web – Presentations can be delivered to remote audiences, and documents and spreadsheets can be published internally for employees to view. Interoperate with traditional file formats – Import and collaboratively edit or publish from .doc, .xls, .csv, .ppt, .txt, .html, .pdf and other formats. You can export as well. "The migration to Google Apps was very simple and painless, and that's exactly what we were hoping for. I foresee the collaboration tools in Google Apps growing in importance, as our sales partners start to use Google Docs to collaborate with vendors, customers, and folks here at corporate." – Shawn Faulkingham, Director of IT, Indoff, Inc.